This is a film that I would recommend to all the people complaining that our professional athletes are overcompensated. Not because I think these people are jealous whiners and that they deserve to have to sit through this forgettable musical filled with unremarkable tunes, dance numbers that don’t ever catch fire, and a story about as thin as Frank Sinatra, though that wouldn’t be totally unwarranted punishment for them. But because this movie teaches us what happens when pro ballplayers don’t make enough money and have to find second jobs from shady gamblers. 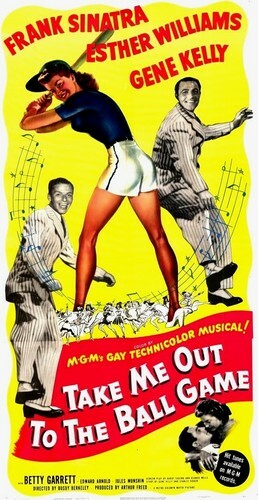 Right from the beginning, the movie demonstrates how desirous it is for our sports heroes to not be forced into off season employment when we meet up with Gene Kelly and Old Blue Eyes as they perform their vaudeville routine that revolves around a lot of singing and dancing to the title song. The offseason should be dedicated to hitting the weight room and getting stabbed outside strip clubs, not going on tour with dancing bears and circus strongmen. I mean, that’s just humiliating. How am I supposed to be worshipping someone for hitting homers when they’re out doing soft shoe at some run down resort in the Catskills? 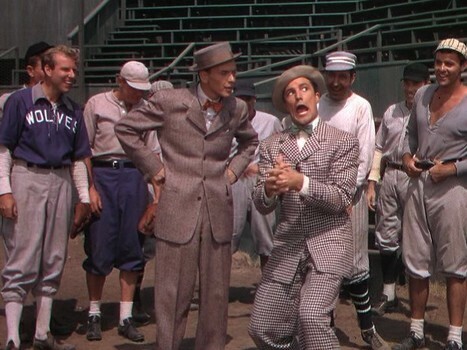 Kelly plays the shortstop on the champion Wolves, while Sinatra is the second baseman. 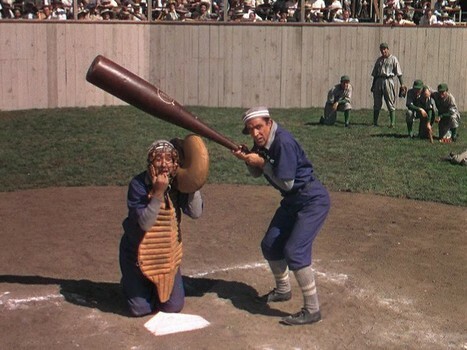 There is also a first baseman named Goldberg, but they only trot him out for stuff like the embarrassing dance number they do at dinner in front of the whole team about their double play combination. Spring training finds our boys off the dinner theater circuit and down in Florida gearing up for another run at the pennant with the Wolves. After a decent song and dance number where the two regale their teammates with all the women they’ve run into over the course of the off-season, the team gets some startling news. They’ve been inherited or sold or lost in a poker game or something to some person named K.C. Higgins! The team immediately begins to speculate about what a know-nothing loser this guy must be while the audience immediately begins speculating about how it must be Esther Williams and that the hijinks are only a train ride away! Once Esther reveals her true identity as well as her expected personality (cool with a surprising knowledge of baseball) and Frank falls in love with her because of how she fielded a grounder, you begin wishing for the Wolves to be quickly eliminated from playoff contention so that all of us can get back to our off season jobs. After a rather pointless scheme that saw Kelly trying to use Frank’s interest in Esther to get around their curfew (it didn’t work – Esther’s the kind of girl after all who goes swimming with a cap on! ), the season finally begins wherein nothing much happens other than a montage of wins for the Wolves. They look just as good as they did last year and are poised for another pennant winning season. So just how is it that the gambler, Joe Lorgan, is going to ensure that his bet against the Wolves pays off? It’s a simple plan really. He knows that Kelly is the best player the team has, so he offers him a job singing and dancing at this new club he’s starting and at twice the pay of his current baseball salary! The money is certainly attractive to Kelly, but he’s not about to quit on his team in the middle of a pennant race. Lorgan agrees to let Kelly have the job as long as he’ll practice at night after he’s done playing that day’s game. Kelly agrees, little realizing that Lorgan’s sinister to plot is to have Kelly so tired that he’ll make a lot of errors and single-handedly cost the Wolves the pennant! Second, and most importantly, has anyone ever watched an entire baseball game? Have you ever noticed how little physical activity it involves when you aren’t the pitcher or the catcher? How many times is Kelly going to have toeven move during a game? The game would be a good time for him to rest up for the nightclub practice later that night. And third, isn’t it really optimistic to think that one guy on a team who is sort of tired is going to screw things up so badly that his whole team’s season is going to collapse? I thought the whole point of a gambler fixing things is that they were fixed into a sure thing. Doesn’t anyone stop to consider that if Kelly quits, he can just go to the cops if the gamblers get rough on him? After all, he did nothing wrong. The weak story combined with the weak production numbers combine to make this the cinematic equivalent of a ground ball rolling under Bill Buckner’s glove into the outfield. 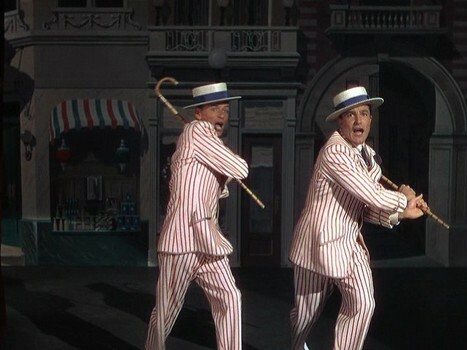 With legendary musical guru Busby Berkeley directing and with Gene Kelly and Frank Sinatra starring, you would expect at the very least, some astounding dance sequences, but none of them are particularly eye catching or choreographed in any memorable fashion. In a movie with this pedigree, you could probably excuse (or even expect) a flimsy story since it should all be just an excuse to showcase everyone’s song and dance talents, but outside of the initial “Take Me Out To The Ball Game” number, nothing close to rousing occurs. Major league talent produces strictly minor league results.